Green roofs can substantially improve attention response and productivity of nearby people, according to new research published in the Journal of Environmental Psychology. The study, conducted by University of Melbourne researchers, assessed the impact of a 40 second micro-break comparing a city green rooftop vista with one of city concrete rooftop structures. Subjects who viewed the green rooftop vista performed tasks with significantly less errors than those who viewed the concrete rooftop vista. Study lead researcher Dr Kate Lee, of the University of Melbourne Faculty of Science, outlined in a media statement that just a moment of seeing some green nature can provide a boost for tired workers. "We know that green roofs are great for the environment, but now we can say that they boost attention too. Imagine the impact that has for thousands of employees working in nearby offices," Dr Lee said. "This study showed us that looking at an image of nature for less than a minute was all it took to help people perform better on our task." The study focused on micro breaks which provide real boosts to attention and subsequent productivity. "It's really important to have micro-breaks. It's something that a lot of us do naturally when we're stressed or mentally fatigued," Dr Lee added. "There's a reason you look out the window and seek nature, it can help you concentrate on your work and to maintain performance across the workday. said Ms Kate Lee. "Certainly this study has implications for workplace well-being and adds extra impetus to continue greening our cities. City planners around the world are switching on to these benefits of green roofs and we hope the future of our cities will be a very green one." she concluded. Based on attention restoration theory we proposed that micro-breaks spent viewing a city scene with a flowering meadow green roof would boost sustained attention. Sustained attention is crucial in daily life and underlies successful cognitive functioning. We compared the effects of 40-s views of two different city scenes on 150 university students' sustained attention. Participants completed the task at baseline, were randomly assigned to view a flowering meadow green roof or a bare concrete roof, and completed the task again at post-treatment. Participants who briefly viewed the green roof made significantly lower omission errors, and showed more consistent responding to the task compared to participants who viewed the concrete roof. We argue that this reflects boosts to sub-cortical arousal and cortical attention control. Our results extend attention restoration theory by providing direct experimental evidence for the benefits of micro-breaks and for city green roofs. Green rooftops can also reduce the energy budget of buildings through improved thermal performance, provide air pollution filtering, increase urban biodiversity, reduce the urban heat island effect, capture rainwater and slow down it's contribution to stormwater systems, and provide open space and urban food production. A good resource on Green roofs in Melbourne and Australia can be found at www.growinggreenguide.org/ Download the Growing Green Guide (17MB PDF), a guide to Green roofs, walls and facades in Melbourne and Victoria, Australia, published February 2014. While this is an excellent resource on the technical specifications and many benefits on Green roofs, it does not deal with the advantages of integration of solar PV with Green roofs except in the briefest superficial way. 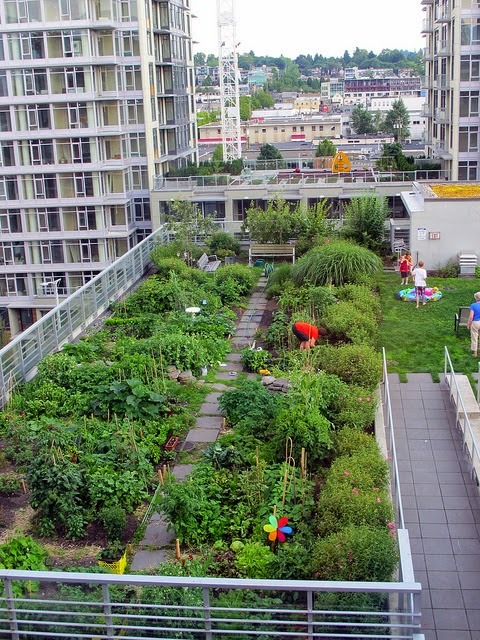 The images on this article are by Christopher Porter (who blogs as canadianveggie) who has produced some excellent photo albums of a 6th floor apartment rooftop garden. 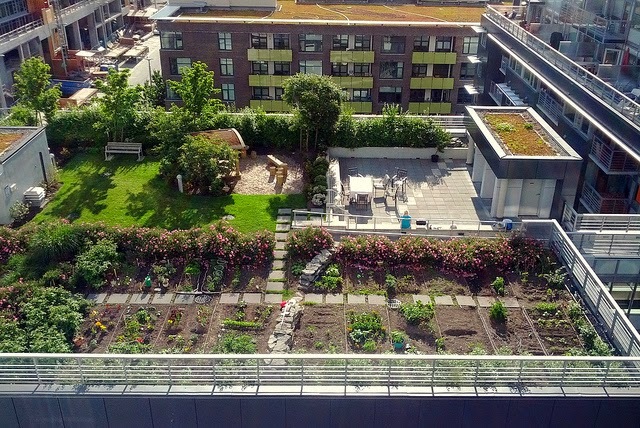 See gardening in 2012, in 2013 and in 2014, located at 122 Walter Hardwick Avenue, Vancouver.